With Shuttle's "R6" chassis design, the SZ170R6 V2 packs a powerful Intel® Z170 chipset to support next gen LGA 1151 Skylake processors. This model can accommodate up to two 3.5" HDDs, one 5.25" ODD and full sized dual-slot graphics cards for demanding graphics and storage applications. With Core™ i3/i5/i7 processors built-in graphics, the SZ170R6 V2 is able to support 4K/Ultra HD video playback via HDMI or DisplayPort. It provides a robust I/O interface including one PCI-E x16, one PCI-E x4, and two M.2 slots and also supports Intel® RST technology. This new Mini PC has built-in Dual Intel® Gigabit LAN, SATA 6Gbps, as well as multiple USB 3.0 ports. Equipped with the new LGA 1151 socket, the SZ170R6V2 supports Intel® 6th generation (Skylake) Core™ i3/i5/i7, Pentium®, and Celeron® 95W processors. Built-in DirectX 12 compatible with the Intel® HD Graphics significantly increases CPU or GPU performance. 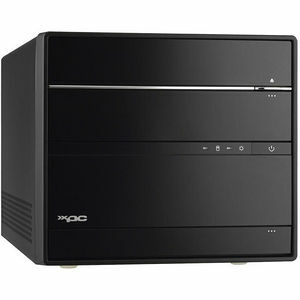 Shuttle XPC series reserves space for installation of one 5.25" ODD and two 3.5" hard disks. With an optional PHD3 accessory users can install a maximum of four 2.5" hard drives or SSD. Shuttle XPC cube features stable, cool, and silent operation with Shuttle's ICE 2 heat pipe technology. It uses convection cooling to dissipate heat away from the CPU. The ICE2 copper tubes, coated in nickel for enhanced tube hardness and rust-proof protection, are filled with distilled water to effectively channel heat and provide highly efficient processor and chassis cooling. The SZ170R6V2 specially is configured four heat pipes of the cooling modules to provide excellent cooling capability than before (three pipes). The SZ170R6V2 provides DisplayPort and HDMI video outputs to support 4K Ultra HD (3840x2160). With four times the resolution of Full HD, viewers can enjoy super detailed and crystal clear imaging of 4K. The SZ170R6V2 is built-in one M.2 2280 with type M and one M.2 2230 type A/E slots to install M.2 SSD and a WiFi card, or other compatible device, providing a strong expansion capability. Watchdog Timer provides excellent security protection for systems that need to operate continuously for a long period of time. Use Shuttle's Watch Dog utility to maintain normal operation and stability of the system at all times. Shuttle's SZ170R6V2 is equipped with an 80 Plus Sliver 500W power supply for guaranteed energy efficiency and energy saving. Shuttle's 500W power supply cuts down on unnecessary power consumption for a higher level of energy saving. The SZ170R6V2 is equipped with Intel® Z170 chipset and supports dual-channel DDR4 2133 with the maximum memory capacity of up to 64GB (16GBx4). It also supports overclocking function and Gigabit LAN, SATA 6Gbps, as well as USB3.0 high-speed storage interfaces, providing superb data transfer speed.